The trial of Brigadier general Pita Driti is bringing a lot of issues to the surface and confirming what most of us already know. That the officers (except for the snitch Mohammed Aziz) don't support Khaiyum and want him removed. It would be safe to assume that this sentiment is shared by most of the population. So why has Khaiyum NOT been removed? 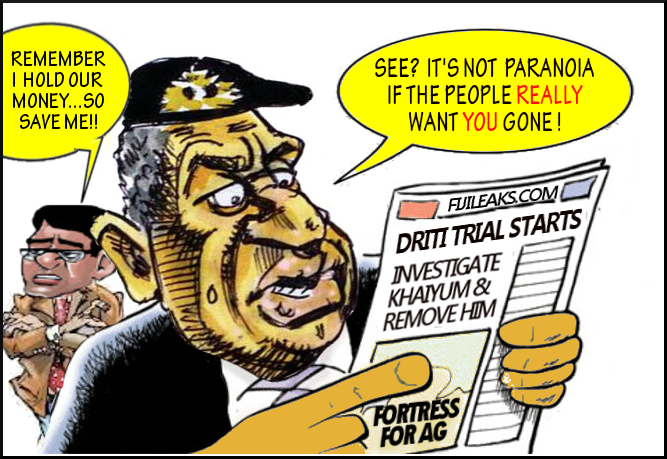 Its all about greed and Bainimarama's deluded belief that Khaiyum has the "plan" that will keep him (Bainimarama) from being arrested and from going to prison. In addition Khaiyum enables Bainimarama to receive more money in the form of multiple salaries, bribes, kickbacks and out right theft. Khaiyum, for his part, gets to run the country as his personal bank, with help from his corrupt relatives and friends that include his aunty bano, Shameem sisters and his father Abdul. Their corrupt activities are racking in millions of illegal kickbacks, bribes and out right theft of Fiji's wealth and resources. Khaiyum is also after the native lands. Most people, however, can see right through his lies, illegal decrees and fancy speeches that resemble a cheap Bollywood movie. The military officers have known for a long time that their illegal Commander is incapable of leading and running the country effectively. They know that he is only a puppet of Khaiyum, and effectively Khaiyum's Chief of Staff. But Khaiyum does not know how to run a country and the proof is in Fiji's poor economy, the worst it has ever been in Fiji's history, the very high national debt that future generations of Fiji will need to repay over many years, the devalued dollar, highest levels of poverty, crime and unemployment (jobs given to workers from China) and the lowest ever levels of investments because no investor trusts Khaiyum. The new roads look good but they were built by foreign workers with even more money being borrowed adding to Fiji's national debt. These are just a few examples of Khaiyum's mismanagement of the country. The military officers know of this and can see the evil impact it is having on the nation. So it is not surprising that they want Khaiyum removed. They also realise that their illegal Commander Bainimarama is nothing more than a jackass puppet, capable of only repeating what Khaiyum says.